Leader Dogs for the Blind proudly introduces our fourth annual Bark & Brew presented by Chief Financial Credit Union! We are excited to once again be partnering with Griffin Claw Brewing Company and Clubhouse BFD in Rochester Hill at Crooks & M59! If a report from the Mid Engine Corvette Forum turns out to be true, the Chevrolet C8 Corvette may not be as close to landing in dealerships as we had hoped. Here is another informative video from our friend Paul Koerner, aka The Corvette Mechanic, who is a GM World Class Technician known for his Corvette expertise. When not working one of the major Corvette shows, Paul can be found in the service department at Key Chevrolet in Middleton, CT.
On the heels of a hard-fought 2018, the Corvette Racing team is beginning this season with a fire in their gut and solid goals in their hearts and minds. There are a few things throughout Corvette production that serve as milestones and classify a specific Corvette to the exact year of production. The split rear window for example, points instantly to the 1963 Corvette coupe. For convertible models, you’ll have to spot those faux grille panels on the hood of the car. On Feb 23rd, the 2019 Hot Wheels event was held at the home of Jay and Patty S. This event raised $291 for Leader Dogs for the Blind. The evening started with a pot luck dinner, socializing and beverage. Everyone then hurried to the race paddock where there was more socializing, beverage, and racing. 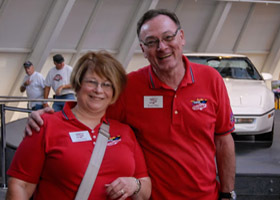 On Feb. 1,2019, members of the GMC Corvette Set Corvette club was able to tour the General Motors Heritage Center along with members of two other car clubs. Paul and Todd of Everyday Driver have just finished their 5th feature-length documentary, “American Original.” In the film, the guys compare 13 Corvettes from all generations to current production to explore the history, legacy, and contributions the Corvette has made to the world of automobiles. Corvette Racing is warming up tires and engines around the famed Daytona speedway in preparation for the up-coming season-opener 24-hour race. We thought a look back at Corvette’s initial foray into the international race circuit might be a fitting hold-over until the flag drops on the last weekend in January. Getting things done within any entity the size of General Motors takes a certain grit. Thanks to devoted people such as Jim Perkins, Corvette has enjoyed constant production, even when bean counters within Chevrolet were sharpening their blades. Has the C8 Mid-Engine Corvette Been Delayed Six Month's For Electrical Problems? Donated items help us add fun and excitement to the Corvette Fest; we use some donated items as door prizes for the Show participants while the others, we sell at the Silent Auction. Personnel from Leader Dogs for the Blind collect and issue receipts for all moneys from the Silent Auction at the Show. Therefore all the proceeds from the Silent Auction go directly to Leader Dogs for the Blind. Some Chevrolet Corvette Z06 owners who track their cars have notoriously experienced cooling issues. According to Corvette chief engineer Tadge Juechter, those problems should be solved, and the even more powerful 2019 Corvette ZR1 shouldn’t experience them at all. How Quickly Does A Corvette Depreciate? Automotive refinishing technology has change drastically in the past 20 years. Heck, in some ways, it changes every year. New tools are invented, old tools are improved, and paint products are updated to keep up with the demands of the industry. Chevrolet’s (worst-kept) secret mid-engine supercar has been spotted on a race track in Germany, in what appears to be production form, four months ahead of its anticipated debut at the Detroit Auto Show in January. Mid-Engined Corvette Spied Testing At The Nürburgring! Jim Smart December 10, 2013 Tom H submitted this article, Thanks Tom! As the former owner of two new C4 Corvettes (an ’86 and an ’89), I’ve often wondered what happened to those two cars that both left my garage a mere couple of years after purchase – with less than 15,000 miles each on the odometer. Are they still running or have they been relegated to a junkyard somewhere? I’ll probably never know. Throwback Thursday: Should You Rest Your Hand on the Shift Lever? The team at Corvette Racing are coming off of their latest battle for the championship at the America’s Tire 250 at WeatherTech Raceway Laguna Seca. The intense competition and a class that is constantly evolving means that the steps to the podium are seemingly getting smaller and taller. You could say that Vincent Paradiso is a Chevy guy. He has a shop in New Milford, Connecticut and his stable of cars are Chevrolet all the way! His stash of Bowties is comprised of everything from a 1932 Chevrolet to a pro-mod Corvette and this high-nosed gasser. Each year, Motor Trend gathers up some of the hottest performance cars and hands one the title of Best Driver’s Car. This year, Chevrolet and General Motors were represented by just one vehicle: the 2019 C7 Corvette ZR1. Balancing an engine's rotating assembly is a critical process, key to both performance and longevity. This video walks you through the process as it happens, for an inside look at balancing a rotating assembly. The National Corvette Museum (NCM) continues to offer its Corvette Experience program, and there are still some spots open. The program combines track sessions with classroom learning to give enthusiasts a one-of-a-kind experience behind the wheel of a C7 Corvette Stingray. A friend of one of our members has a 2004 Corvette Z06 for sale. This is a Torch Red, show quality vehicle. Read More: Click Here to read the details regarding this vehicle. What is an octane rating and what does it mean? WJBK interviewed representatives of the GMC Corvette Set today, Friday June 16, 2017. The interview covered Corvettes in general and the Club Show Corvette Fest in particular. Corvette Fest is tomorrow June 17, 2017 rain or shine at Canterbury Village. Click here to watch the 'On The Nine Article' and Club Member interviews. Click here for more information about Corvette Fest. (WJBK) - The 12th Annual Corvette Fest is happening this weekend at Olde World Canterbury Village in Lake Orion. It's on Saturday, June 11 from 10 a.m. - 3 p.m. Approximately 150 Corvettes will be on display this year. Spectator admission to Corvette Fest is free and all are welcome. The event benefits Leader Dogs for the Blind. Orion Neighborhood Television visited Corvette Fest. Joe Johnson's interviewed Tom Hoenle, President GMC Corvette Set, Maureen Smith, Leader Dog Special Event Manager; Club Members Bob Crane and Larry Dixon and participant Robert Frank. Click here to view Joe's video report. Several of the Club Members were at Fox News early Saturday morning to talk about our Club's work for Leader Dog and Corvette Fest. To see the Corvette Fest Team in action, the video interview and read the story click here. MCCC 2014 "Best of the Best"
Alex is the President of his High School's Club called "Teen Car Talk". Their Club's goal is to spread resources that they think are informative and fun to read. They are trying to make connections with other car lovers as well and have used the GMC corvette Site as a resource. They found a page about the history of the Corvette that they think we would enjoy.